Samsung is swallowing up JBL parent Harman Industries for its presence in the automotive market, but the storied brand churns out tons of home audio gear, too. Harman subsidiary JBL took the wraps off nine new audio products at CES on Wednesday, but we think this trio is the most interesting of the bunch: The Cinema SB450 sound bar is a 2.1-channel home theater system with a wireless sub, the Playlist is a table-top speaker with integrated Chromecast audio-streaming technology, and the BassPro Go is a portable Bluetooth speaker. While the BassPro Go name will conjure images of fishing trips for some, it is nonetheless the most compelling announcement of the three. It comes with a dock that's designed to mounted in the trunk of your car, where it will perform as a subwoofer supplementing your car's audio system. When you arrive at your destination, you can remove it from its dock and it will rock on battery power as a full-range portable speaker, using your smartphone or tablet as a Bluetooth source. JBL says the BassPro Go performs as well as a conventional 8-inch sub. To us, it looks remarkably similar to its JBL Xtreme Bluetooth speaker. And if the bass performance comes close to that of the Xtreme, then we’re inclined to believe JBL’s claim. JBL’s BassPro Go is a hybrid car speaker that you can undock and use as a wireless Bluetooth speaker. The BassPro Go speaker features a high-efficiency 140mm subwoofer, two 40mm full-range transducers, and two 140mm passive radiators. The system’s overall frequency response is rated to play down to about 40Hz. The BassPro Go’s subsystem allows users to customize EQ settings and enhance bass response to their listening preferences. When undocked from your vehicle, JBL says it can operate as a conventional battery-powered Bluetooth speaker for up to 15 hours on a charge, with up to three Bluetooth sources connected.You can also plug a cable in the speaker's USB port and tap its battery to charge other devices. Thanks to JBL's Connect+ technology, you can wirelessly link several speakers together. We’ve tested this feature in other JBL speakers and found it to be a slick way of building out a distributed audio system (with a limited range of course). The BassPro Go sports a water-resistant IPx7 covering to protect it from rain and spills, which should make it a great speaker for tailgate parties or a day at the beach. JBL says the speaker will be available summer 2017 at a retail price of $599.95. High-res audio continues to gain ground, and JBL's Playlist combines that feature with support for Google's Chromecast audio-streaming technology. Its onboard DAC can support audio bitstreams with up to 24-bit resolution and sampling rates as high as 96kHz. JBL’s new Playlist features Chromecast and streams hig-res audio over Wi-Fi. 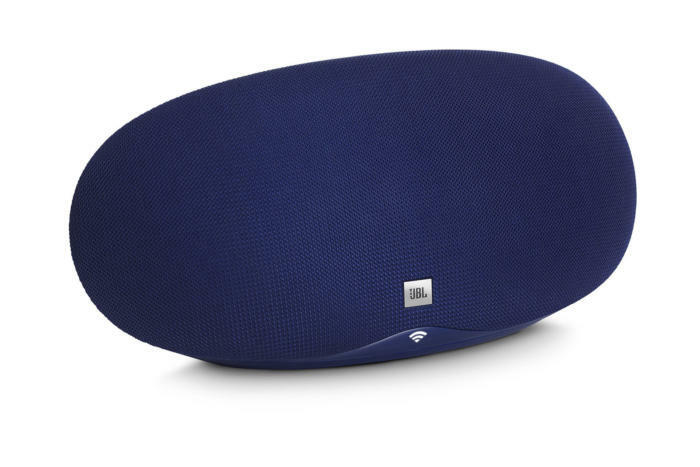 The JBL Playlist’s design features a wide-open surface for better sound quality and a metal passive radiator for what the company claims is class-leading bass performance. Its matte finish and grille fabric cover help the Playlist blend into a variety of decors. JBL says that the Playlist will give music lovers the ability to stream music, radio, or podcasts directly to the speakers with the touch of a button via its built-in Chromecast technology. The Playlist lets you seamlessly listen to music by simply tapping the Cast button from a favorite music service on your smartphone without any interruptions from phone calls or text messages. Use the “One Touch” Play feature on the Playlist speaker to play your favorite playlist instantly. To amplify the listening experience, JBL Playlist connects to other Chromecast speakers in different rooms of the house. Multiple source devices can connect to the speaker simultaneously, giving everyone in the home a chance to play DJ. The flexibility doesn’t stop there. Thanks to it’s dual-band Wi-Fi, the Playlist can function as a stand-alone speaker without the need to be tethered to a phone. JBL’s design also allows listeners to access their favorite music instantly from popular music services like Spotify and Pandora without needing to go through the hassle of pairing the Playlist to a mobile device or need to be within a fixed proximity of the speaker. However, should you want it, you can still play music to the Playlist via Bluetooth or the included 3.5mm input. The JBL Playlist will sell for $149.95 when it becomes available this spring. JBL is a major player in the home theater space, and its JBL Cinema SB450 is a mid-priced, 2.1-channel sound bar/wireless subwoofer combo designed to deliver awesome audio experiences to accompany 4K UHD video. The sound bar half of the equation is equipped with three HDMI 2.0 ports with support for HDCP 2.2 copy protection, an Audio Return Channel (ARC, so that the TV it's connected to can send its audio signal back down the same cable to the speaker), and HDR (high dynamic range). HDR is essentially a greater differential between the brightest and darkest points in an image, and many say the difference between high dynamic range and standard dynamic range has a bigger impact on picture quality than the transition from 1080p to 4K. 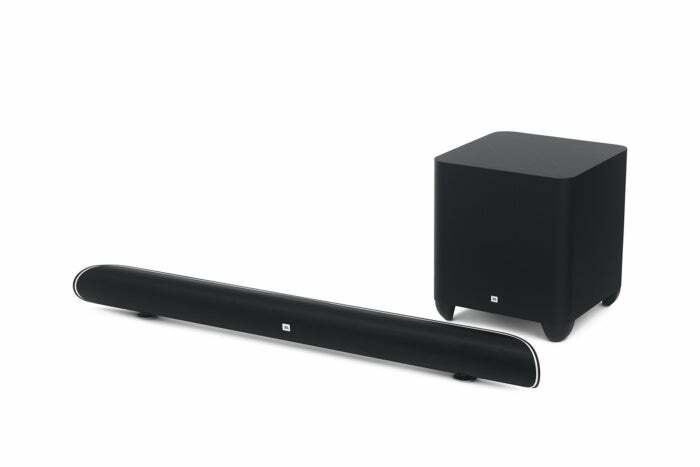 JBL’s SB450 Soundbar sports a wireless subwoofer, dialog-enhancement technology, and the ability to add more speakers via Bluetooth. 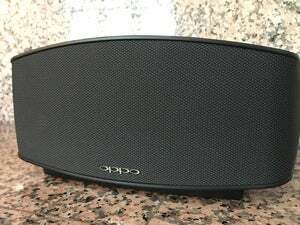 The included wireless subwoofer, sports an eight-inch cone driver powered by a 200-watt onboard amplifier and can be placed nearly anywhere in your room without anything more than a power cable. One of the largest complaints consumers have with modern TVs is their sub-par audio, which most often manifests itself with incredibly poor dialog reproduction. JBL says movie lovers will enjoy clear dialog and voice enhancements for crisp, clean sound during films and TV shows without having to adjust the volume. The SB450 includes a TV remote control learning feature where users can program the soundbar to accept signals from their existing TV remote, eliminating the need for multiple remote controls. The SB450 also allows you to amplify your listening experience by connecting JBL Connect-enabled speakers together over Bluetooth. The speaker will automatically switch between television audio and phone or tablet audio thanks to JBL's SoundShift technology. 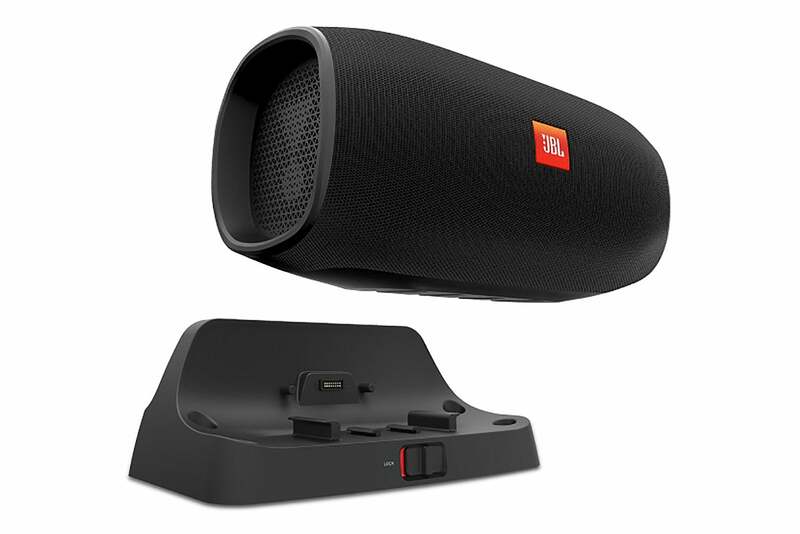 The JBL Cinema SB450 will be available this spring for a retail price of $499.95.